A small home: This mission-style sofa table will help to keep items close at hand, while also adding a place to sit/ a dining area. Entryway or mudroom: Place it in the entryway or mudroom as a spot for decor and to store small items, while creating a setting put shoes on and take them off. Living room: Create an extra place to sit whether behind the couch or against a wall. Dining area: Unexpected guests? This sofa table and optional bench can provide a place to eat or an extra bench to pull up to the table. The possibilities for this solid wood sofa or hall table are truly limited to your imagination, and the optional bench makes it even more versatile. 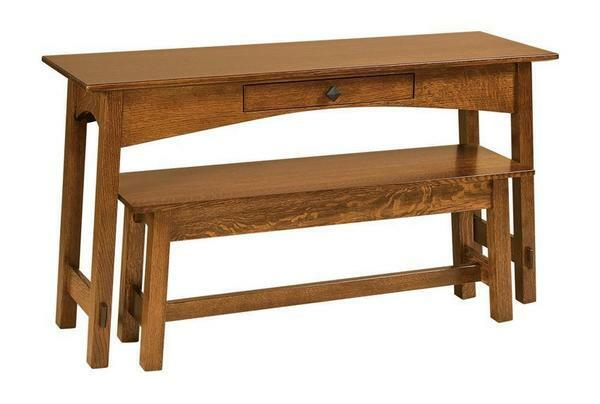 Features of this versatile mission-style furniture include 1-inch thick tops on the sofa table and bench, a soft-close drawer with dovetailed maple drawer box, arching aprons on the sofa table, and exposed tenons. Shown in quarter sawn white oak with CF 7992 Asbury stain and #3 hardware, but customizable with a variety of wood types, finishes, and hardware options to choose from. Note: Nesting bench will be built with the same species wood as selected for the sofa table.